Ocelot Productions and Griffin Independent present the World Premiere of A RIFF ON KEEF : THE HUMAN MYTH, by Benito Di Fonzo, at the SBW Stables Theatre, Kings Cross, 25 November - 12 December, 2015. This is not a biography of the Rolling Stones, or Keith Richards, this is a mythical character - Keef. A fiction created by a combination of my subconscious and my readings on the real thing. It's a riff on the idea of this ancient creature. A comic riff, a mythical riff, a musical riff. Poetry is a form of music, and theatre grew from epic poetry, from storytelling. Tall-story telling in this case, a.k.a. the fine Australian tradition of taking-the-piss. Enjoy in moderation. I have never been a STONES fan, I was in the other camp, THE BEATLES. So I was never much interested or enamoured with anyone in the Rolling Stone. Mick Jagger, the only one of the band that penetrated my resistance and registered in my psyche - the lips, the hips! So, it has been a puzzlement to me, in very recent times, to have a rather 'notorious' and 'second banana' figure (for me) such as Keith Richards to be hagiographied. His autobiography: A LIFE, by Keith Richards and James Fox, in 2010, has been a best seller and the effect of it has been for the media of all kinds, to re-present to me Mr Richards as a "consummate gentleman". No, really! So, this play was a virtual 'virgin' journey - for me - through the life of Keith Richards (I suppose) through the permission of a riff on a guy called Keef - a human myth. The play became an Odyssey with this mythical figure, called Keef, in pursuit of his grandfather's Holy Grail: the mythic chord! - which, of course, he finds, ultimately, has always been within himself. We travel through episodes of a hard childhood and parental inspiration, bluesy musical amours such as Chuck Berry and Muddy Waters, into the world of rock 'n roll with lots of distracting and distracted camp-followers, drugs, massive scarves and haze, in hazy, hazy days. What was best was the 'epic poetry' of Mr Di Fonzo's language, its rhyming slang and poetic hyperboles. For, the spine of Mr Di Fonzo's journey, for an unacquainted patron, such as myself, wandered, wandered and wandered, too long. If you knew who Keef was, there may have been a more cogent map apparent to help one follow the play with more interest. However, the language is deliciously baroque in its vocabulary and structures - a sound-feel as grand as Howard Barker's can be - e.g. VICTORY - 1968, THE CASTLE -1985, - which enforces the colourings and cheek of this Monty Pynthonesque-like invention, or Tales of the Arabian Nights sojourn. Of course, some editing would help to keep one tirelessly delighted. It was a dark pleasure to my ears, if a trifle overdone at times (Oscar Wilde's SALOME, with its carbuncled-jewellery of image, tumbled back, as I listened to this Riff). Like the play about Lenny Bruce, the company of actors: Branden Christine, Abe Mitchell, Lenore Munro, Terry Serio and Dorje Swallow, all play instruments and create music to take us through some of the episodes, and when that happens the play picks up with an energy that spikes attention, where, otherwise, it tends to float about without forceful direction and some confusions of the identity of the characters. The fact that none of the STONES music is used (because of the cost of Copyright, I presume) is no real impediment to delight in their tune makings, doings, although, perhaps, a little frustrating for the fans. 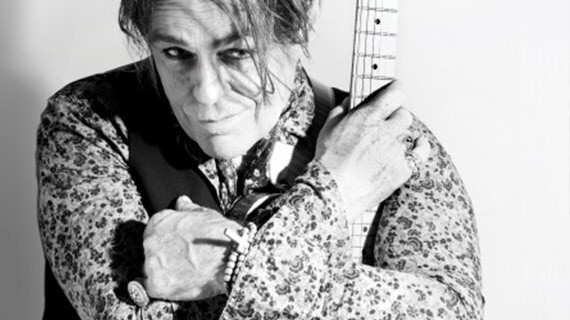 Mr Serio, playing Keef, has much skill and feel, affection, for the music and is impressive in the invented aspect of Keef's musicianship, although, the sustained inner-tempo of his character is tiresomely held - a dramatic poetic-licence to present us with other than a drugged-dream tempo would help one to stay engaged. The other actors create all the other figures in the riff and do so with varying degrees of success with their defining, shifting details. I wished they had had more relish for the language. It does not feel as if the Director, Lucinda Green, has as firm a conception of the way to deliver the material as she had with the Lenny Bruce play - maybe dazed in an idolatrous feel for the real man and his story. The Set Design by Hugh O'Connor has atmosphere, amusing though it is to see a cast-propelled 'lazy-susan' wheel, circling the characters around the space. The Lighting is by Sian James Holland. A RIFF ON KEEF: THE HUMAN MYTH, will probably please those in the know of Keith Richards. For the rest of us, if you go, remember the facts have been distilled into a myth about a figure called Keef, and just go with the flow, the float. The language of the writer may be a joy - a rarity of invention on the Aussie stage.